Linda Morado before and after treating herself with cannabis oil. Via: illegallyhealed.com. This article was first published by IllegallyHealed.com. In August 2014, Linda Morado received the most devastating news of her life — a diagnosis of stage IV kidney cancer. It had metastasized to her lungs in two places. The month prior, Linda had also been diagnosed with celiac disease and nutrient malabsorption issues. Despite these overwhelming challenges, Linda was determined to live. With eight years of experience in the United States Army, she intimately understands the value of a fighting spirit. She also has a large family to take care of, including five children, fifteen grandchildren, and two great grandchildren. Thankfully, through the power of cannabis extract medicine and unwavering spiritual belief, Linda is now cancer free. 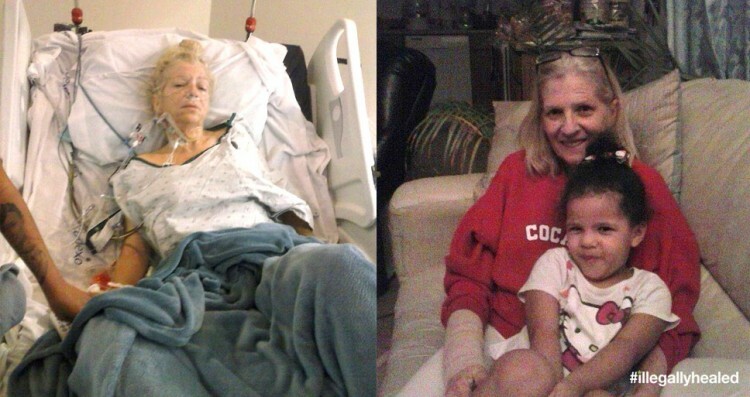 Linda was given 10 months to live by her doctors. She underwent a surgery in an effort to extend her life, which included removal of her right adrenal gland and drainage of fluid in her right lung. After working through a number of emotions, Linda decided to use cannabis extract therapy. The first oil she acquired was weak, which she discovered after four weeks of ineffectiveness led her to have a lab test conducted on it. It tested at 46 percent tetrahydrocannabinol (THC). The next batch was far stronger, testing at 85 percent THC, and caused her to sleep for most of the initial four or five days of treatment. Within a couple months, Linda’s energy and weight substantially improved, indicating the oil had positively impacted her celiac condition. A December 18, 2014 oncologist appointment revealed the lung cancer had disappeared, which surprised the doctor. He told Linda to continue doing what she was doing. By January, the cancer was completely gone. There are strong scientific studies behind all this. A study published in the Journal Molecular Cancer determined that cannabinoids may inhibit cancer cell proliferation and induce cancer cell apoptosis. Basically, the cancer cells commit suicide! It is a tragedy that lab-tested cannabis extracts are not more readily available — if they had been, Linda could have avoided the initial setback she experienced. As stories like hers become better known, the demand for safe access will become overwhelming and eventually result in reform. UPDATE: A May 11, 2015 PET scan confirmed Linda is still cancer free. She is also now ready to go back to work.